A coffee-flavored take on the famous Tres Leches Cake! 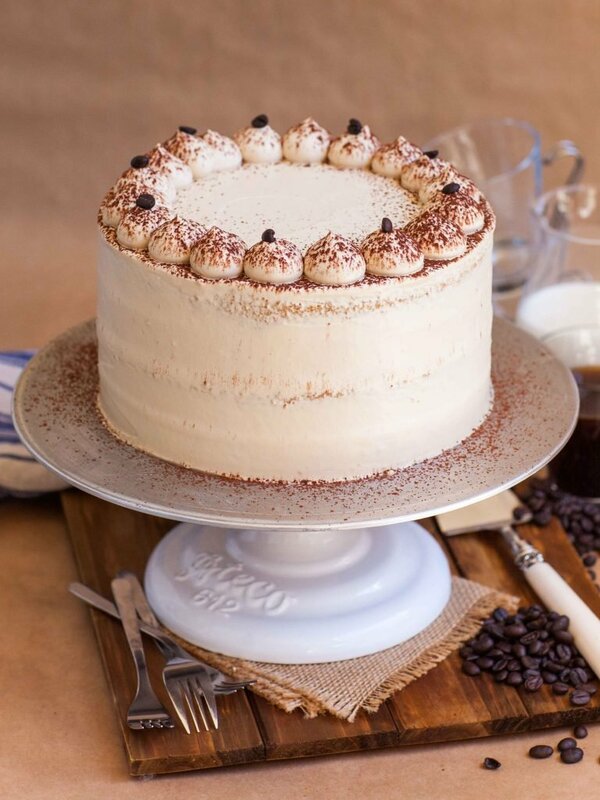 This incredibly delicious coffee cake creation will steal your heart (and taste buds)! 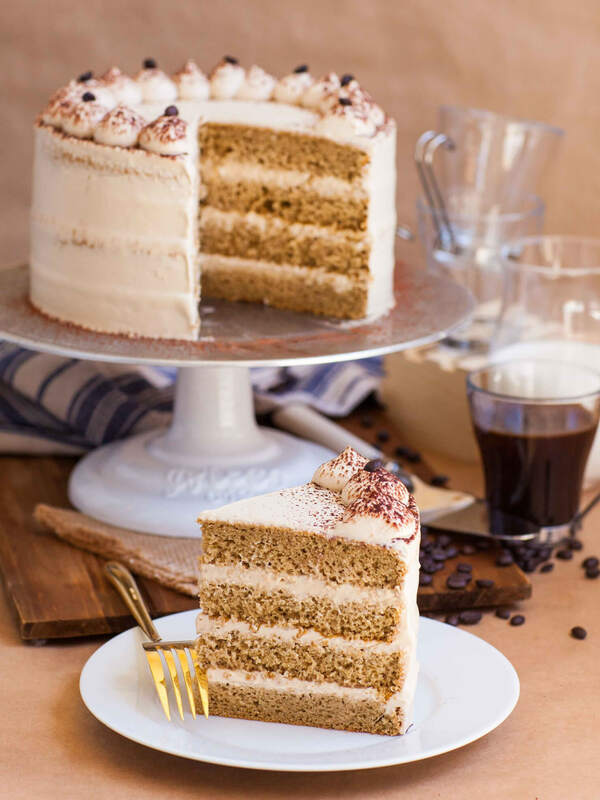 For this coffee tres leches cake, I start out with an airy and fluffy coffee sponge cake, soak the layers with a coffee flavored milk syrup and frost with a coffee whipped cream. The coffee syrup will soak into the sponge cake layers beautifully, yielding a moist cake that melts in your mouth! Make sure to VERY generously soak the sponge cake for best results! Make sure to watch my video recipe for all the details! Every bite of this tres leches cake is filled with incredible coffee flavor! When making this cake, I recommend letting it sit in the refrigerator overnight for the layers to come together and set. It will be well worth the wait! If you’ve never had a tres leches cake, you’re in for a real treat! This Mexican cake is traditionally made with a simple sponge cake that’s soaked with a combination of three different milks, hence the name! Try garnishing the top with dollops of coffee cream, a dusting of cocoa powder and whole coffee beans. Preheat the oven to 350F (177C). Line the bottom of two, 8-inch (20-cm) round cake pans with parchment paper; leave the sides ungreased. Prepare the coffee sponge cake first. In a stand mixer bowl, whisk together the eggs and sugar on high speed for 7 to 8 minutes, until the eggs are thick, voluminous and pale in color. In a small ramekin or bowl, dissolve the 1 tablespoon instant coffee powder in 2 tablespoons boiling water. Pour the dissolved coffee into the eggs and mix again for 30 seconds. In a separate bowl, combine the dry ingredients: flour, almond flour and baking powder. Sift the dry ingredients into the eggs in small batches, folding gently but thoroughly after each addition. Divide the batter evenly between the two pans. Bake the layers in the preheated oven for 33 to 35 minutes, until the tops are set. Remove the layers from the oven and allow them to cool completely in the pan. Once layers are cooled, run a knife along the edge of the pan to release the cake. Use a long serrated knife to split each layer in half, resulting in four layers total. For the coffee syrup, first heat the milk in a microwave safe measuring cup until the milk is steaming hot. Add the instant coffee and stir until it's dissolved. Add the sweetened condensed milk, evaporated milk, then stir until all three milks are well combined; set aside. Prepare the coffee whipped cream. In a small bowl, dissolve the instant coffee in the boiling water. Add the dissolved coffee into a large mixing bowl along with the softened cream cheese (or mascarpone) and sugar. Whisk the ingredients together for a few minutes until completely smooth and creamy. Add the chilled heavy cream and whisk again until semi-stiff peaks form. The frosting should be fluffy and hold its shape. To assemble the cake, soak each sponge cake layer very generously with the prepared coffee milk syrup, then frost with whipped cream. Frost the top and sides with a flat spatula. Transfer any remaining cream into a pastry bag tipped with a simple round tip; garnish the top of the cake with dollops of cream. Sprinkle the top with cocoa powder and add whole coffee beans, if desired. Thank you so much for posting this recipe..Was waiting for this coffee cake..Planning to make this today. Hi Asiya! Yes, I’m sure that coconut flour would work well with this recipe, too. You’ll need the same amount. Can I do recipe in half? Would it turn out good? Recipe it calls for 9 eggs, should I do 4 or 5 eggs or 4.5? If I don’t have a stand mixer, am I able to use a hand mixer to make the cake batter? I haven’t seen this anywhere on your recipes but could I possibly take your cakes recipe and bake it in 6″ cake pans? Thank you! Is this applicable to all your cakes or just this one? And one last thing how many 6″ pans would I use? Two or three? I plan to make this cake next Friday for an event on Saturday. I see from the video you recommend storing the cake in the fridge overnight …do I need to cover the decorated cake with something when it is in the fridge to protect the appearance of the cream frosting ? If so , how would one cover it without touching the frosting? Would you allow the cake to come up to room temp before serving? Hi! There’s no need to cover it with anything. If you have any very aromatic dishes also in the refrigerator, I recommend sealing those so that the aroma doesn’t get absorbed into the cake. Hope you enjoy the recipe! I have made this cake a few times and I have to say that it is absolutely delectable OMG!!!! BUTTTTTTTTTTT whenever I make it, it sinks in the middle. I have years of experience in baking and no I dont open the oven or anything and I follow the recipe to the T. Any ideas on reasons why? I’ve had that happen to me, too! I recommend baking the cake for just a few minutes longer and don’t grease the sides of the baking pan. As soon as you take it out of the oven, run a knife along the edge to loosen the cake from the sides. I want to make this cake in a 28 cm round cake pan. How many times do I need to multiply the recipe to fill it? Also, any tips for the baking time/ oven temprature? hi i really love your cake and the recipe. I’am cakelover. Especially european cake. Can’t wait your cake cookbook to published. is your cookbook will be sold in indonesia?? Just wanted to knw can i take flour instead of almond flour wth the same ratio? 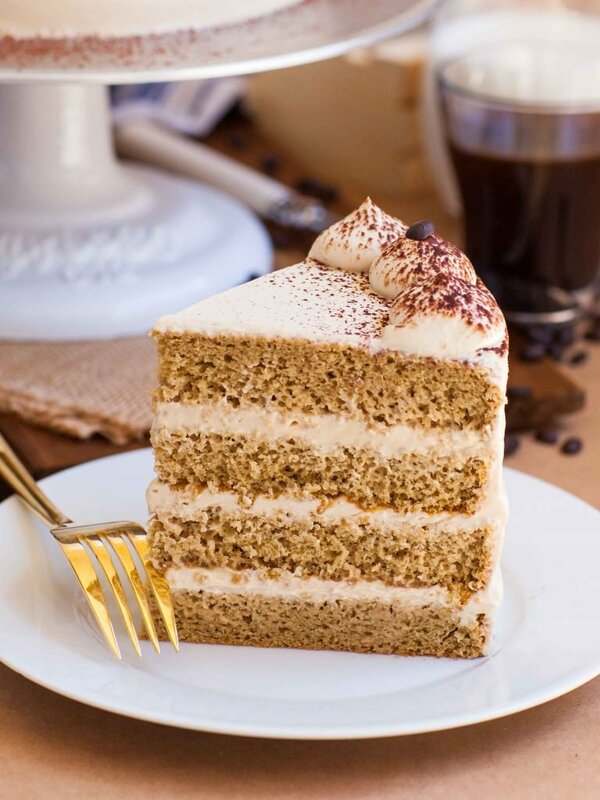 Hi Tatyana this cake looks absolutely gorgeous, I’m a coffee lover and I’m going to try to make it this weekend but I cant find almond flour, would it work if I just use regular flour and how much instead of the almond flour. i made this and it’s amazing. super light and fluffy and just really nice to have after a meal. i also love this cream as an alternative to buttercream, which is very stable and delicious, and not as sweet. Hi Tatyana, if I’m going to bake in 9 in pans, do I have to reduce the baking time? I made this yesterday for my sister’s birthday. It was a huge hit! Absolutely delicious! A few notes: I used two 9 inch pans instead but I still had a lot of batter leftover. I made a third 8 inch cake as well that was just for my husband and me. The layers needed to bake for only about 27 minutes and they were perfect. There was quite a bit of syrup left after I doused the 9 inch layers so I just poured it over the 8 inch. I made 1.5 times the amount of frosting because the layers were an inch bigger, and I like a lot of frosting. Overall, this is an excellent recipe! Highly recommend! I am planning to make this cake in a 21 x 15 x 1 inches sheet. Since I only have one sheet, should I make one recipe of this cake and pour the entire batter into the sheet or should I halve it? I’d like to make it 2 layers so I’d have to bake it twice. Do you think 2 layers would be tall enough for a sheet cake? Also, should I double the frosting if 2 layers is enough? Should I adjust the baking time and temperature for the aluminum sheet? Hi! If you want to do a sheet cake, I recommend doubling the recipe. The recipe is portioned perfectly for one sheet pan layer. 2 layers would be great! 🙂 And yes, I would double up the frosting recipe. Enjoy! Is there any adjustment needed for baking time & temp?